"Superior Quality. Custom Bench Cushions." If brown is the main color for your design project, we offer different shades of Sunbrella brown fabric that will go with any setting. 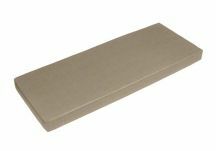 For spring or summer, our Sunbrella Antique Beige Bench Cushion is our best selling solid brown fabric almost two to one. If your design needs a spectacular pattern, then you will surely like our Sunbrella Mojito Coffee Bean Bench Cushion, which has gained in popularity over the last few years with both designers and home owners.